This butterfly was observed along a pathway near Machakos, Kenya, May 2017. The larvae (caterpillars) of this and related species feed on the foliage of plants in the Acanthaceae family. These plants tend to be rather common on range lands where cattle, goats, and other ungulates graze. This is because there are phyto-chemical, natural plant compounds, that deter feeding by mammals. 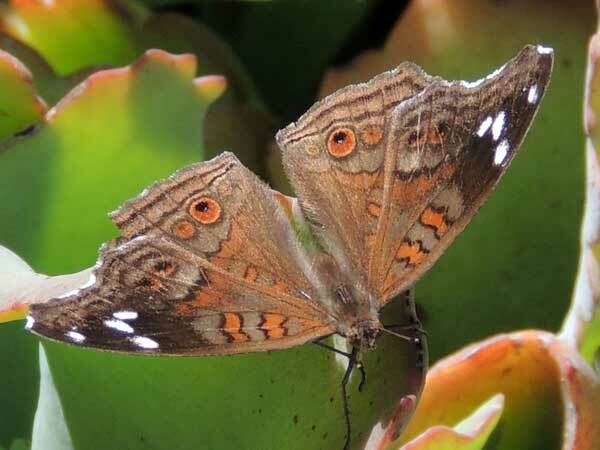 The butterflies, however, can detoxify these compounds and thrive on these otherwise toxic plants. The result is that several pansy butterfly species are also very common. The Natal Pansy may have a lot or almost no blue-ashy wash over the chocolate brown base color. Use the image search link below to see the range of this seasonal and geographic variation. Copyright Michael J. Plagens. Page created 23 Sept. 2017.